Still unsure if you want to participate in the fight against Devovorga? 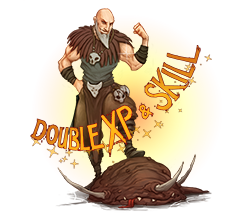 Help your comrades to defeat that evil pestilence and your world will be blessed with a nice regeneration bonus during the upcoming double XP and skill weekend! Between the server saves of September 07and September 10, all monsters will yield twice the usual amount of experience points, and your skill training, including magic level, will advance twice as fast. The skill progress when training offline will also be doubled. Grab your weapons and join the fight!